DON'T let those chiseled good looks and perfume ads deceive you. Brad Pitt is just the sort of man you'll want by your side when the zombie apocalypse comes. 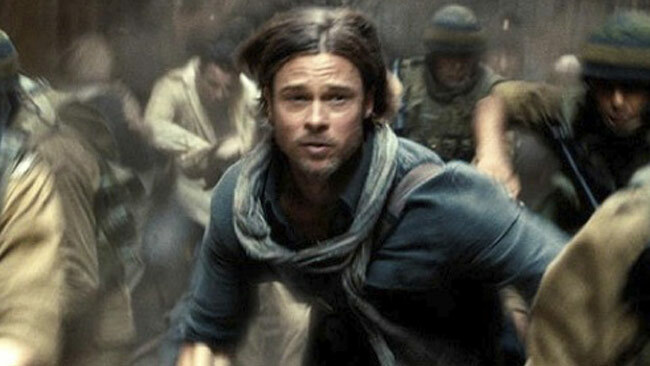 Pitt plays a loving family man dropped into the middle of zombie warzone in next year's blockbuster World War Z, a serious adaptation of Max Brooks' hit satirical novel about zombies taking over the Earth. The new trailer for the film shows him facing a tidal wave of the undead as he hops from one plagued country to the next, rescuing survivors. The zombies in this film aren't the slow-moving kind; they're fast and there are millions of them, rushing at their victims en masses in the hope of a quick bite. World War Z was supposed to come this December but studio heads pushed it back to June next year to accommodate reshoots and a reworking of the script by Lost writer Damon Lindelof.